There are many brands of amps and cabinets on the market, and most use the same generic components with some cosmetic differences. 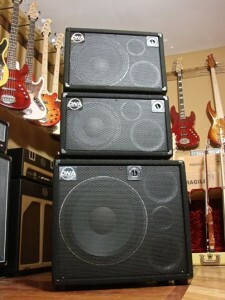 Not David Nordschow Amplification! DNA speakers, cabinets and amplifiers are built to our own specifications and feature components designed by our in-house expert, David Nordschow, and manufactured only for DNA.We do NOT use off-the-shelf, generic components. DNA cabinets feature custom-built speakers, only available through All cabinets are designed with unique ports and acoustic features that deliver high efficiency and high performance tone. DNA amplifiers feature unique circuitry not available elsewhere, and have passed through rigorous player testing to ensure that they deliver pure tone in a powerful, easy-to-operate format. If you want to sound generic, look elsewhere. But if you are ready for a High Performance Bass Experience, then it’s time for DNA.